Below are our favorite perfume campaigns. We are introducing the perfumes along with the celebrity that features in their campaigns. Jimmy Choo: English actor Kit Harington from Game of Thrones is the face of Jimmy Choo Man Perfume. Jimmy Choo Man is the first fragrance for men from Jimmy Choo. It’s a very modern and sophisticated. Fragrance Notes: Pink Pepper, Suede, Lavender, Melon, Pineapple, and Patchouli. Bulgari: Australian actor Eric Bana from Troy is the face of Bvlgari Man Extreme. Bvlgari Man Extreme is inspired by Rome’s vitality. It’s an elegant, intense and attractive. Fragrance Notes: Calabrian Bergamot, Haitian Vetiver, Pink Grapefruit and Amber. Gucci: American actor James Franco from The Interview is the face for the Gucci pour Homme by Gucci. Gucci Pour Homme was launched in 2008. It’s a masculine and refined. Fragrance Notes: Cypress, Violet Incense, Tobacco Leaves, Patchouli, Amber, Bergamot and Jasmine. Balenciaga: American actress Kristen Stewart from Twilight is the face of Florabotanica Balenciaga. Florabotanica by Balenciaga is aimed at the younger generation of consumers. It’s beautiful and dangerous. Fragrance Notes: Wild Mint, Turkish Rose, Carnation, Vetiver Roots, White Amber and Hemp Leaves. 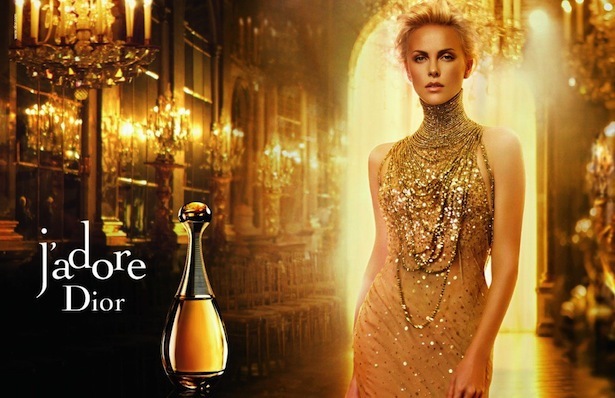 Dior: South African actress Charlize Theron from Sweet November is the face of J’adore by Christian Dior. J’adore was created in 1999. It is a luxurious, sensual and feminine fragrance. Fragrance Notes: Vanilla, Blackberry, Rose, Pear, Jasmine and peach. Lancome: American actress Julia Roberts from Pretty Woman is the face of La Vie Est Belle by Lancome. La Vie Est Belle is “inspired by joy and pleasure in small things.” It’s Joyful and deep perfume. Fragrance Notes: Vanilla, Patchouli, Iris, Jasmine, Black Currant and pear. Next PostYou should Get These Fall Fragrances NOW !